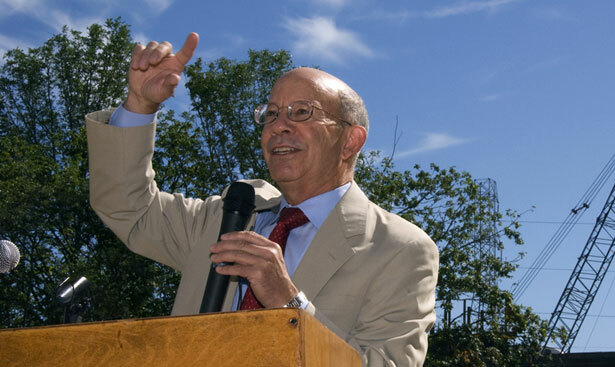 Congressman Peter DeFazio is calling on Americans to ask President Obama to stand up for rural post offices, urban sorting centers and an essential American service. The congressman has battled the bureaucrats with some success. Along with Vermont Senator Bernie Sanders and Wisconsin Congressman Mark Pocan, DeFazio was in the forefront of the successful fight to block the postmaster general’s wrongheaded proposal to end Saturday mail delivery. He even found some rural Republican allies for that skirmish. But the Oregon Democrat knows it’s going to take more than defensive moves by Congress to save the USPS. Now, he wants to up the ante by enlisting President Obama in the struggle—or, to be more precise, he’s come up with a strategy to get the president more engaged with saving the postal service. Obama has sent some good signals; indeed, his budget borrows ideas advanced by Sanders and DeFazio for making the USPS more competitive. But the congressman is right to want the president to play a more pivotal role in saving post offices and sorting centers, rural routes and urban facilities, from a death by slow cuts. The stronger and louder the support from Obama, the greater the likelihood that the Postal Service Protection Act—which has the potential to gain support from disengaged Democrats and reluctant Republicans—could be enacted. So DeFazio has taken the rare step—as a congressman—of posting a petition on the Obama administration’s “We the People” website. About 80% of USPS financial losses since 2007 are due to a Congressional mandate to prefund 75 years of future retiree health benefits over 10 years. In 2012 USPS lost a record $15.9 billion, but $11.1 billion of that loss went to prefund healthcare. This must change. USPS shouldn’t move to 5-day delivery. This would only save 3%, risk further revenue losses, and slow mail delivery. USPS needs to re-establish overnight delivery standards to ensure the timely delivery of mail and prevent the closure of mail plants. USPS needs to generate more revenue by ending a 2006 ban prohibiting USPS from offering new products and services. Does the Administration support HR 630 and S 316 to make these changes, save American jobs, and allow USPS to remain competitive? To get a formal response from the White House, the petition must gather 100,000 signatures by May 23. Almost 20,000 people have already signed. But now it’s crunch time. President Obama faces plenty of pressures these days, but this is one intervention he can and should make on behalf of American workers and communities. The USPS cannot take many more cuts. Nor can it shoulder the financial burden that’s been imposed on it. This is a time for urgency. And Peter DeFazio, with his White House petition, has figured out how to focus the energy that is needed to beat the proponents of privatization and to save an essential public service. Lobbyists are snagging top jobs in Congress—a boon for their former employers. Read Lee Fang’s report.